Florida is a unique place for bird photography in North America. The geography of the peninsula provides a natural funnel through which countless numbers of migratory birds fly on their way to and from Central America and the Caribbean. This workshop is timed to take advantage of the spring migration, mating and nesting season along Florida's East Coast. Many species of birds make Florida their home year round. Raptors, wading birds, song birds can all be found here, as are many Audubon Priority Species, such as the Bald Eagle, Black-necked Stilt, Wood Stork, and Roseate Spoonbill. 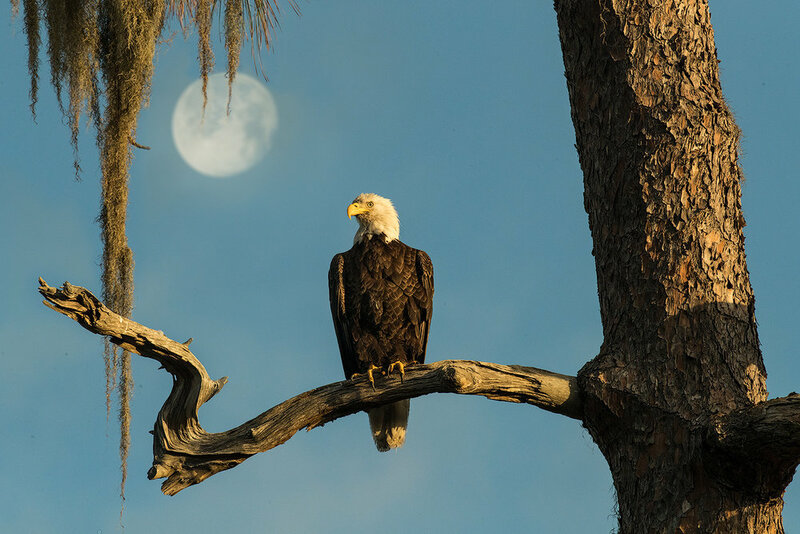 Florida has one of the densest concentrations of nesting bald eagles in the lower 48 states, with an estimated 1,500 nesting pairs according to Florida Fish and Wildlife Conservation Commission. This one nests at the Greenwood Cemetery near downtown Orlando. We will visit a variety of locations during the workshop in order to maximize our opportunities to photograph a wide variety of birds and other wildlife. Workshop locations include Blue Cypress Lake, Viera Wetlands, Merritt Island National Wildlife Refuge, and St. Augustine Alligator Farm Zoological Park. These locations may change depending on where the birds are available. All of the locations for this workshop can be reached with a minimum of walking. What's Included: Field Photography Sessions, All Park and Preserve Admission Fees, Class Session on Digital Image Processing, Critiques, and Image Print Session sponsored by Canon. We will have a cooler with soft drinks and water while in the field, and a box lunch will be provided on the days noted in the schedule. The Wood Stork is a common site in the spring in Central Florida. It is the only stork that breeds in the United States. Placed on the Endangered Species list in 1984 it has made a successful comeback and was downlisted to Threatened status in 2014. The importance of balancing shutter speed, f/stop, and ISO to achieve sharp images. Choosing the best background and camera positioning for the most dramatic shot. Locating and approaching birds. The importance of the raw image. Shooting tips and techniques. April 9 - Afternoon Meet & Greet at workshop hotel, followed by orientation, then dinner. 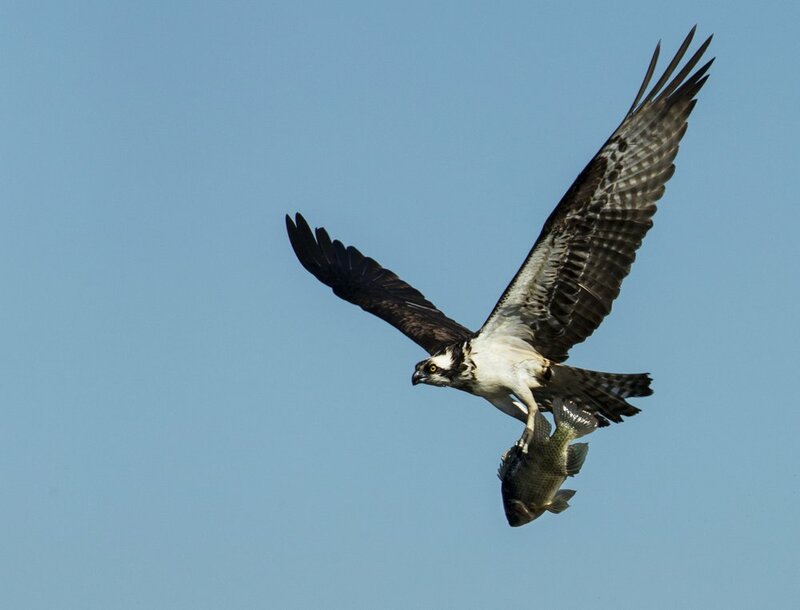 April 10 - Early departure for Blue Cypress Lake, one of the largest nesting sites for Osprey in the state. Box lunch and drinks will be provided. Afternoon and sunset on the lake. April 11 - Check out of workshop hotel, drive to Viera Wetlands, for morning photo session. Lunch in Titusville. Afternoon and sunset in the Merritt Island National Wildlife Refuge. Drive to workshop hotel - Check In. April 12 - Morning photo session where we will get up close with many nesting birds. Afternoon/sunset photo session. April 13 - Morning/sunrise photo session. Lunch, Afternoon post-processing session, critique and Canon sponsored printing session. Farewell dinner. You may choose to pay in full for your workshop, or place a $500.00 deposit to hold your reservation. When you choose the deposit option the balance of the workshop fee will be due on February 4, 2018. Until January 9, 2019 you may choose to place a $500.00 deposit to hold your place in the workshop, after that date all workshops must be paid in full when registering. Great Egrets vie for food as the water in their feeding pools retreats after the rainy season. What's Not Included: Lodging, airfare, and meals, other than those mentioned above, are NOT included in the workshop fee. Great Blue Herons nest building at Viera Wetlands. This is one of the best places to photograph these beautiful birds in Central Florida. It is possible to rent equipment in Orlando. There several fairly well stocked camera stores in the area. An Osprey carries its catch to a nearby nest. Blue Cypress Lake has one of the largest populations of these "fish hawks" in Florida. "Hooty" the Barred Owl hangs out around the camping area at Blue Cypress Lake.